Coach Lis breaks down her goals for the CFMakeover. In October 2010 I competed in another box's Paleo Challenge and came in third place. I ate strict paleo for 30 days...no booze, no grains, no dairy. My only indulgence was a post-workout shake that wasn't entirely paleo. At the time I was a bartender at the Nook, on Piedmont Park. YES I was pouring fish bowls and surrounded by totchos at every shift and I STILL stayed clean. SOBERTOBER, ya'll. It was worth it. In 30 days I lost 7# of bodyfat AND gained 4# of muscle. I FOUND MY ABS! I slept better, felt stronger and got relief from my seasonal allergies, IBS and acne. Since then, I continue to eat 80/20 paleo... indulgences are weekend alcohol, dark chocolate and sweet potato fries. In November, I compete in the USAPL state powerlifting meet. I'm currently about 10# heavier than the weight class I hope to compete in. So I need to cut weight, yet maintain my strength. I will eat strict paleo with exceptions for pre/post workout supplements, limit alcohol and sugar, and focus on recovery to stay healthy. *I'll lean on my girl Chef Veronica at Edesia Meals, the BEST paleo meal delivery service in town, for most of my grub. *I'll also cook a few meals on Sundays to freeze/save as backups. SO EXCITED it's pumpkin season. NO, not the fake syrup sh*t they put in your coffee. REAL pumpkin, like the kind I'll put in this pumpkin chili recipe... my FAVORITE of the season. *AND I'll shop in the CFM Pro Shop for a few backup snacks like Paleo Kits & Epic Bars. What are your goals for the CFMakeover? Post in the comments below... Not registered yet? What are you waiting for? Get in the game to change your life by Halloween! Check out CFMakeover details here. We'll place the CFMakeover t-shirt/v-neck orders Monday. Let us know your size! Work in teams of 3-4. Complete in any order, but once you start one movement, you must complete all reps before starting another movement. THURS 09.26.13 So what IS paleo? With the CFMakeover right around the corner, let's address a common question: What IS paleo and why is it so common with CrossFitters? Paleo is a very clean, back-to-basics way of eating. It's not a fad, it's not a trend, it's a lifestyle. It's free of all the refined foods, trans fats and sugar prevalent in the Standard American Diet (SAD :(). So what foods are paleo? Meat & seafood, fruits, veggies, nuts, seeds and healthy fats...the way our bodies were meant to eat...the way our ancestors ate before the Industrial Revolution when grains & corn syrup & chemicals (Yellow #9 anyone???) invaded grocery stores. This is why people who follow a paleo lifestyle have more energy and lower instances of conditions like autoimmune disease, heart disease, depression, IBS, seasonal allergies and other inflammation issues. We'll discuss paleo in more detail at our CFMakeover pre-challenge huddle meeting this Saturday at 10a. I'll break down the basics for you guys & take questions. I have tons of great resources and tips so don't miss it! If you're still on the fence about joining the challenge & want to come to the meeting this Sat to ask questions before deciding whether to join, BRING IT ON! GO HERE to sign up for a prelim measurements time slot. Great energy in our noon class Monday! I've done a lifestyle challenge before (last year’s Whole Life Challenge) and I learned a lot about what works for me. As a moderate pescatarian (by that I mean I'll eat salmon and that's about it for meat), my diet is mostly comprised of veggies, fruit, fish, nuts and some quinoa. I take SFH Fortified & Recovery protein after workouts, which has really helped my progress & recovery. My issue with the last challenge was I felt like I leaned out too much. I'm what you would call a "hard gainer" and if I'm not diligent about meal prep I've noticed that my gains slow down a bit. *Eat moderately Paleo but include quinoa, SFH protein, and oatmeal from time to time for breakfast. Tirzah competed with Team CFM at the Rise of the South competition a few weekends ago & set new PRs in her clean AND clean & jerk! She's ready to set more PRs in next months CFMakeover. 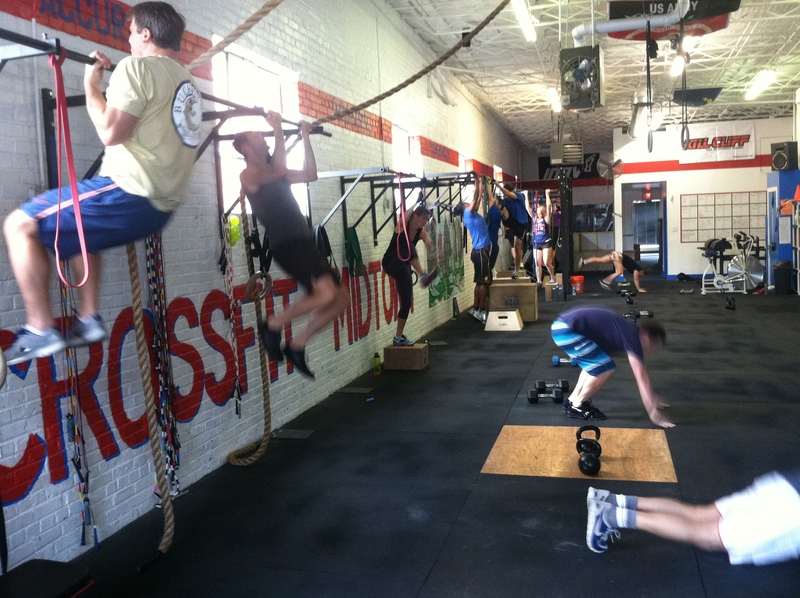 *For med ball throws, get into a sit up position about 6-8 feet from the wall. Start with your back flat on the ground and the ball overhead. Sit up while flinging med ball against the wall, catch and repeat. Post total number of reps on bench & pull ups to comments. TUES 9.24.13 Last day for CFMakeover Early Bird perks! Last day for CFMakeover Early Bird perks! Our Fall challenge starts October 1...that's just ONE WEEK AWAY! To sweeten the deal, we have a few bribes to entice you to get in the game early! Gold members - one 15-minute skill session with Coach Lis or Coach Beka, to work on a skill of your choice. Silver, Bronze or Basic members - free Open Gym access in October. 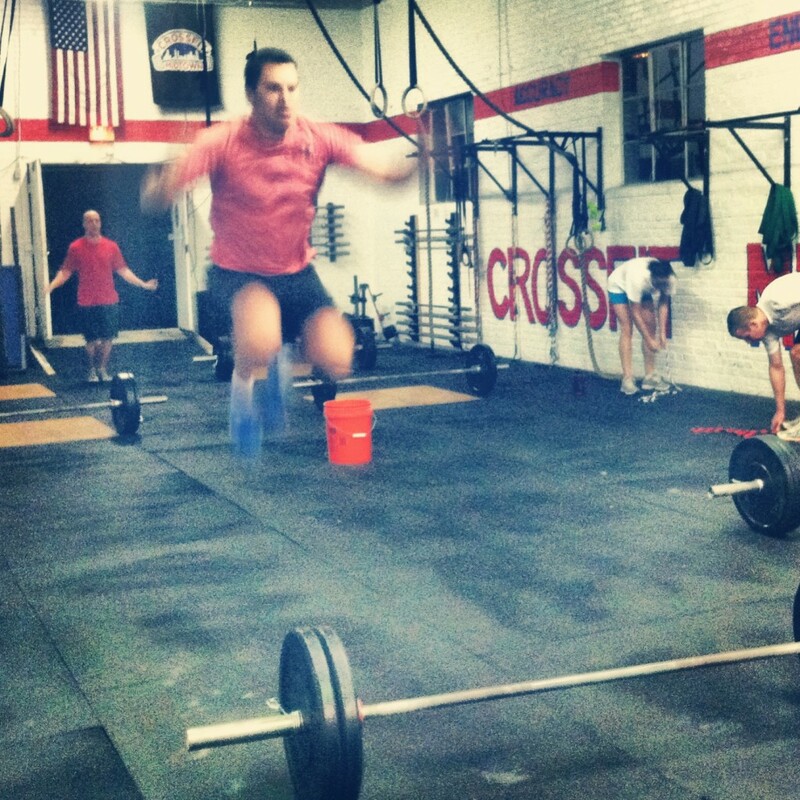 You can attend CFM’s Open Gym sessions WITHOUT using one of your weekly visits. Open Gym times are Tues 8-9p, Wed 8-9p, Sun 1-2p. Remote non-members - one 15-minute nutrition consult with Coach Beka. *These perks are not interchangeable (in other words, no, a Basic member can’t opt instead for a skill session). Check out CFMakeover details here. 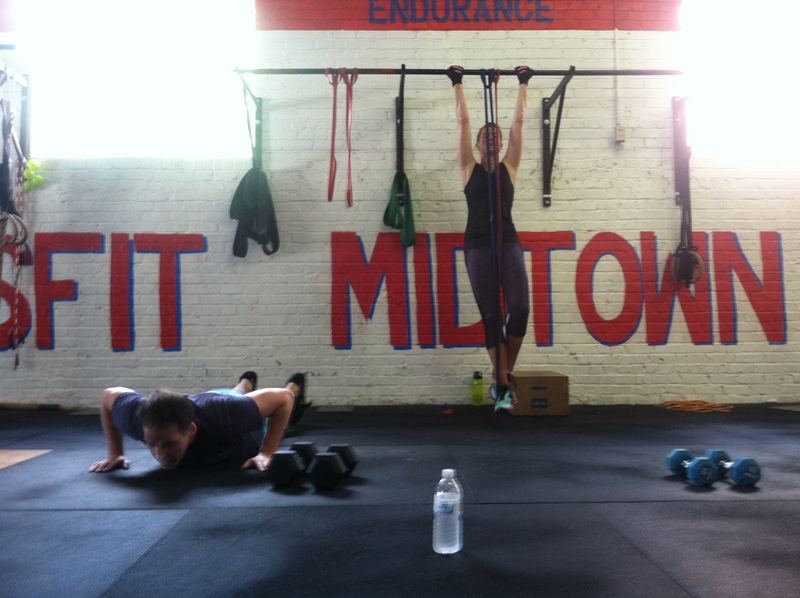 Leslie and Kevin powering through burpees and chin ups! This isn't a nutrition challenge. You decide your goals and we'll help you get there. Of course, the cleaner you eat, the better your results will be, but I get it CFM football fans... some of you want to fall off the wagon once a week (or maybe every weekend). Be honest. Is that better than you usually do? Probably. If so, you have something to gain (or lose?) from this challenge. After you register, you'll tell us whether your goal for the month is to lean out or bulk up (get lean or get swole?). We will give you tips based on EITHER goal. The PRIMARY habit that will help you reach either goal is QUALITY SLEEP. Get 7 to 9 hours in a cool, dark room (yes, Midtown-high rise dwellers, you need blinds to cover that gorgeous city view while you sleep). For those who want to lose body fat or have never tried the paleo diet, we recommend following the Whole 30 plan for 30 days of strict paleo. This means you'll eat meat, vegetables, some fruit, nuts and other good fats. You won't eat grains, dairy, legumes or sugar of any kind. We'll help you do this, by sharing plenty of great recipes like these OR referring you to a local paleo meal delivery service. CFM recommends Edesia Meals. If you're an endurance athlete or "hard gainer" (as in, you've always been on the lean side...maybe even scrawny. And it's tough to put on muscle), we'll recommend a paleo diet (LOTS of protein) plus starchy vegetables (white potatoes, yucca, sweet potatoes), more fruit, and a few grains (white rice, oatmeal) on your training days. Get all the details here. Register by Tuesday to get the Early Bird perks. If you choose to eat strict paleo during the CFMakeover, here's what that entails. One teammate rows. 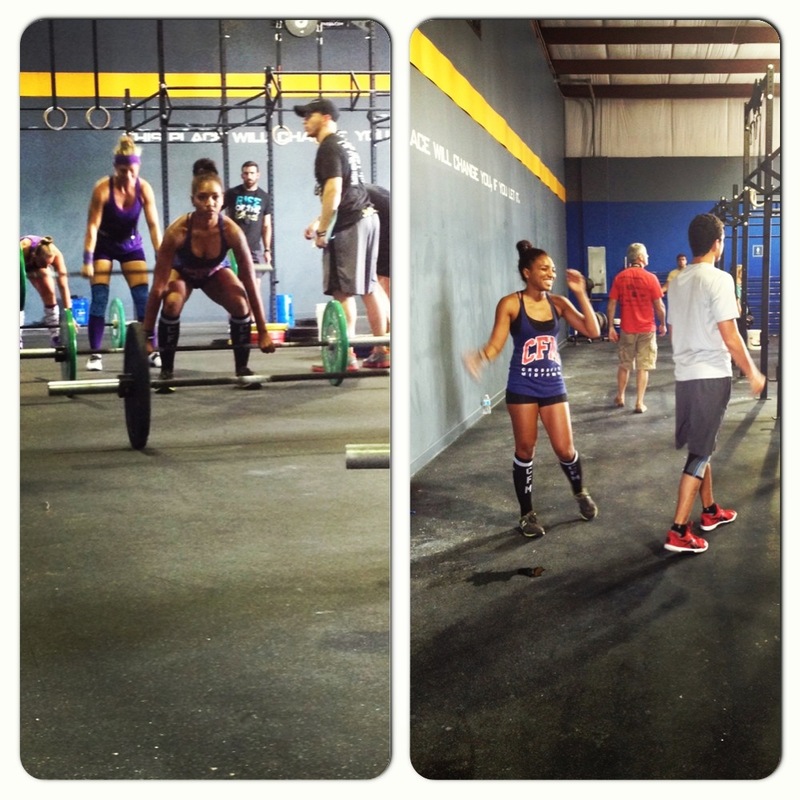 One teammate does kettlebell swings. One teammate holds hollow or superman position. Final score = 5k row time MINUS total number of kettlebell swings. Subtract one second per kettlebell swing. At CFM we have weekly staff meetings, and every Monday we share our positive focus and critical tasks for the week. I've realized when it comes to my personal tasks (preparing meals at home, sticking to my workout routine, etc), there's always something that lingers around for a while without getting accomplished. From now on when I realize that I'm putting a task off to the side, work or personal, I'm going to come up with something to hold myself accountable to...aka, something I would HATE having to do if I don't get that task done by the deadline. Thanks to Lis for sharing this blog post containing tips, phone apps and programs to keep us accountable to our goals. I will definitely be putting some of these to work during our CFMakeover Challenge next month! Hans making tuck jumps look easy! 15 Air Squats or 1 round of "Cindy"
Beka recently posted an awesome blog with a great listing of places to get locally-grown groceries. There are so many reasons to eat locally-grown or locally-sourced food, but if you’re feeling lazy, hate cooking, or simply don’t have the time, you can still get your farm-to-table fix. Atlanta actually has a number of really yummy restaurants that serve local food. So pick one from the list below, and dig into some backyard deliciousness without the hassle of cooking. If you know of any others, share the knowledge with your fellow CFMers in the comments! Our Fall challenge starts October 1, and just to sweeten the deal, we have a few bribes to entice you to get in the game early! Register by next Tues, 9/24 AND you get the following perk:Gold members - one 15-minute skill session with Coach Lis or Coach Beka, to work on a skill of your choice. 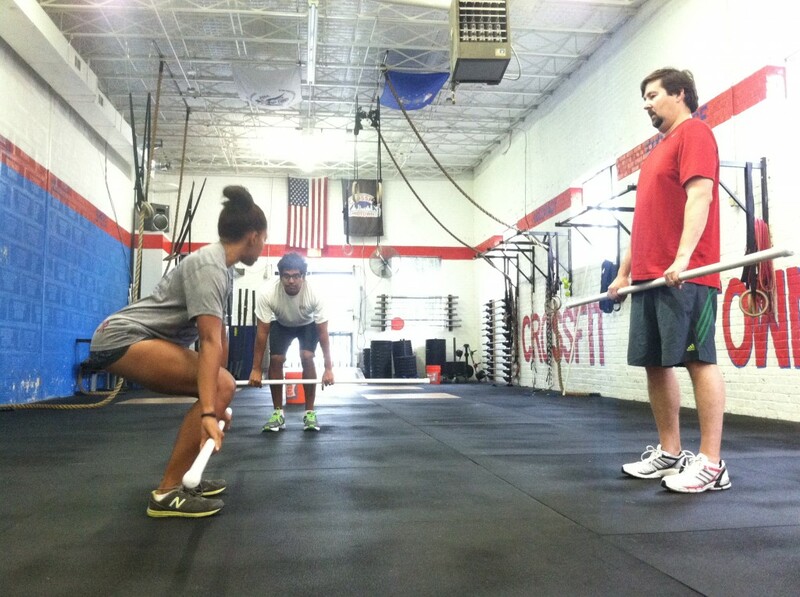 Coach-in-training Tirzah leading Bob L and Shri through power cleans.